Chamonix’s ski areas are spread out throughout the valley, offering a great choice of slopes for all abilities. These are easily accessible thanks to the efficient system of Chamonix buses which run throughout the valley. Buses are free with your ski pass or the guest card which your accommodation provider will give you on arrival. 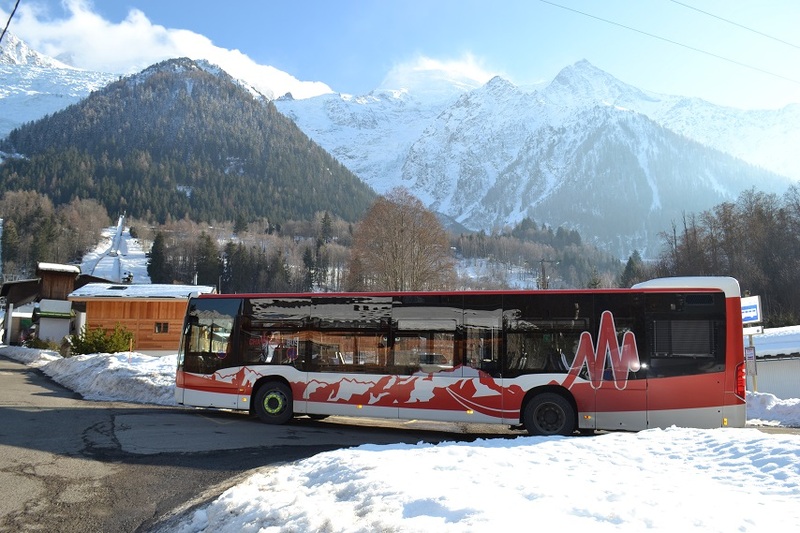 And they’re the perfect eco-conscious choice, as the main Chamonix buses are hybrid vehicles and the local town centre shuttle buses are 100% electric, meaning fewer emissions. The main lines which run through Chamonix valley are the #1 and #2 which each run every 30 minutes in the winter, between 6.15am and 8.45pm. Line #1 runs from Les Houches to Les Praz via Chamonix, meaning it’s great for getting to Les Houches and Flégère ski areas. Line #2 runs from Les Bossons to Le Tour via Chamonix, Les Praz and Argentière, giving access to Flégère, Grands Montets and Le Tour ski areas. You can switch between the two lines at Chamonix’s main bus station (Chamonix Sud) or in Les Praz at the foot of Flégère ski lift. In winter, there are also express lines which run directly to the different ski areas to minimise waiting times and ease traffic on the main routes. 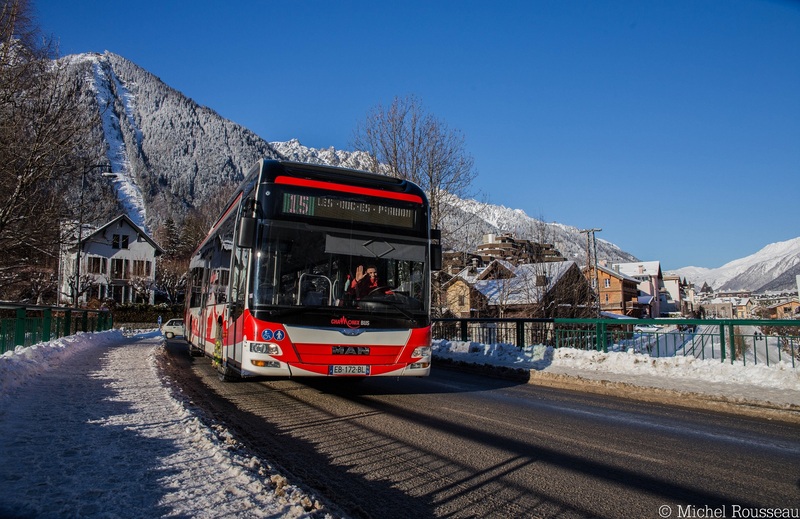 Note that the 11 and 12 Chamonix buses do make additional stops after February holidays end. #17: allows for Park+Ride, shuttling between Le Grepon and Brévent ski area via the town centre. Chamonix also offers a 100% electric shuttle service every 10 minutes in winter which loops around Chamonix town centre and is 100% free – perfect if you’ve come out without your lift pass or guest card! It’s called the Mulet (French for mule) and is named in honour of the mules which used to help take travellers up to the Mer de Glace in days gone by. Find out more on the site of Chamonix Buses (Mont Blanc Bus). The Mont Blanc Unlimited ski pass includes skiing in Megève – St Gervais, as well as Courmayeur in Italy, and you can still take public transport to get there, so no need for a car. Check out the weather forecast and book up to the day before to enjoy skiing in another resort. You’ll just need to take the receipt or the voucher for your lift pass so that they can activate it for skiing in these other ski areas. The linked ski resorts of St Gervais and Megève are less than 30 minutes from Chamonix and offer beautiful, tree-lined, motorway pistes. They are particularly good for families and can be accessed via the shuttle bus which stops in Megève. The bus is organised by the Compagnie du Mont Blanc and is free with your Mont Blanc Unlimited ski pass. These Chamonix buses run every day during school holidays and Wednesday-Thursday-Friday throughout the rest of the winter. The departure point is the Hotel Heliopic in Chamonix centre, behind Aiguille du Midi cable car on the main road, and there are two buses each morning – one at 8am and one at 9.30am (times are approximate, check the website for exact times). You’ll need to book online before 4pm the day before. If you’re looking for great skiing and even better food on the slopes, then a trip to Courmayeur in Italy is not to be missed on your trip to Chamonix. The skiing is included in your ski pass, which also gives you a discounted rate for the dedicated public bus service of around 15€. Departures are from the main Chamonix bus station at 8.30am or 9.30am, with return trips leaving Courmayeur at 4.30pm and 5.30pm. Bear in mind that times and costs are approximate and may change each year. Once you’re through the Mont Blanc tunnel, the bus stops at the Skyway Monte Bianco, the rotating cable car which goes up to the Pointe Helbronner. From there, it’s an easy 5-minute walk to the Val Veny cable car which will whisk you up to the ski slopes. Find out more at the offices of SAT Chamonix, at 13 avenue Michel Croz, by phone +33 450 530 115 or online www.sat-montblanc.com. Book online at www.savda.it, at the SAT office in Chamonix or in Chamonix Sud. In the morning, make sure you get there 15 minutes early so they can check your lift passes and tickets. Don’t forget your ID card or passport for crossing the border to Italy! Find out more about getting around Chamonix valley.